I truly love sport, it has one of the most unifying effects in the World. A great moment in sport could lead to two complete strangers hugging each other in a completely un-awkward, unobtrusive way. It got me thinking about the different moments in sport that have made me want to hug a stranger. But instead of only hearing from me, I enlisted some help from my mates on Twitter and asked them to share a moment that made them hug a stranger. The Reason: After a tense series we faced our nemesis the Aussies. Australia batted first and broke every heart in South Africa as they manhandled the SA Bowling line-up to score 434. South Africa then took on the impossible and through the inspired Gibbs and Smith, the Proteas got close. Of course, in this country we never make things easy and lost wickets all along the way. But no man is more up to a fight than Mark Boucher and the moment when he hit the four to seal the victory was one which led me to embrace everyone in the near vicinity. A true moment in time when sport makes everything else not matter. The Reason: For much of the first season in the Emirates stadium, Arsenal were being criticized for struggling to turn the new stadium into a fortress, drawing many games. On the 21st January, the league leaders came to visit the Emirates and an Arsenal side who were having a terrible stop-start season, found themselves behind to a Wayne Rooney header. As the clock passed the 80 minute mark, United still led and would have condemned Arsenal to a first league defeat at the new home ground. But Arsenal dug deep and equalised through then youngster Robin van Persie (Who fractured his foot with that goal). But then the sweetest thing of all happened, Thierry Henry, a man who had been criticized throughout the season for failing to deliver at his usual standard, climbed onto an Emmanuel Eboue cross and hit a bullet header (yes, really, a header) past Edwin van der Sar in injury time. I was watching at the Arsenal South Africa Supporters club and remember hugging everyone in reach, even sending my glasses flying across the room. 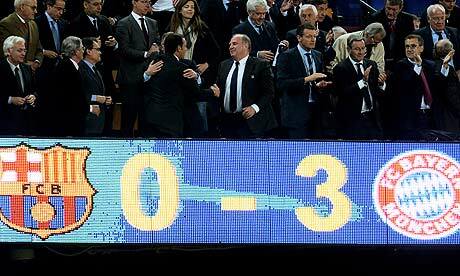 The best part of the win was beating Manchester United in Fergie Time. The Reason: The 2010 FIFA World Cup was a long time coming, from the day that Sepp Blatter pulled our name from that white envelope the excitement for the tournament began. Come June 11 2010 and I was a mixed bag of nerves, jitters and pure excitement. We grabbed a taxi into town, climbed onto the Reya Veya and made our way to the magnificent Soccer City stadium. For the next few hours I savoured the atmosphere, walking around the huge calabash bowl taking in the sights and sounds of the, mostly, Mexican fans mingling with the Bafana Bafana supporters. Singing our national anthem just before kick-off was an incredibly emotional experience and then the match got underway. I was watching the match with a very close friend of mine, Sean Riskowitz, and we had traveled the Bafana path together for many years so it was apt that I watched this specific match with him. Cue the 55th minute, some neat inter-passing on the halfway line sees Dikgacoi pick out a superb pass to release Tshabalala into space on the left hand side of the area, ‘Shabba’ takes a touch, the ball sits up perfectly and he unleashes an unstoppable effort into the top corner. Pandemonium in the stands as Soccer City erupts! I’m hugging Sean, I’m hugging the guy next to me, I’m jumping up and down screaming, I’m high-fiving people behind me and in front of me… I think I was still bouncing up and down a full five minutes after the goal. Watching the replays of that goal still sends shivers down my spine to this day, simply a moment I will never ever forget. The Reason: Though naturally left-footed, he popped it over with his right foot in sudden death overtime. English journalists, accustoked to so many World Cup disappointments in all codes since 1966 literally burst in to tears and hugs. Fact. The finest moment among so many. The Reason: I was a Wednesday season ticket holder back then, attending many home and away games throughout the campaign despite being just 15-years-old. We’d finished fifth in the league, beaten Brentford in the play-off semifinal and made it through to the final, against Hartlepool United. This game was the culmination of the season. This game saw around 40,000 Wednesdayites pack into Cardiff Stadium to witness one of the best games of football that I think I’ll ever watch. 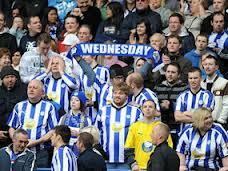 Wednesday fans transcended on Cardiff that day. Myself and my best mate got our pie and got to our seats, only to find that they would not come in handy at all. Along with the other Wednesdayites we chanted our way throughout the whole game, not sitting down for a second, making our presence known. With 81 minutes of the game gone we were 2-1 down and it looked as though our dreams of a return to the Championship were set to be dashed. However, Steve MacLean managed to slot in a late penalty (prompting my first hug of a stranger) and the stadium literally erupted. As if our nerves needed the extra work, we were going to extra time. 30 more minutes of nail-biting moments as we attempted to secure promotion for ourselves. Then it happened. Four minutes in we went 3-2 up (second random hug) and the noise was once again deafening, although we knew that one goal was never going to be enough. Although, when Drew Talbot popped up in the 120th minute (queue third random hug) we knew we were safe and dry, we would be back up in the Championship the following year and would have a MASSIVE party to celebrate it. All-in-all I would have to say that that game is one of the the greatest moments of my life, let alone of my sporting memories, and will forever hold a place in my heart. Come on Wednesday! The Moment: Bayern Munich defeating Barcelona 4-0 in the first leg of the semi-finals in the Champions League. 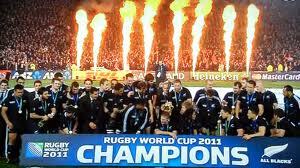 The Reason: A lot has been said about the All Blacks and their inability to win “the big one”. Injury plagued at critical times during the World Cup of 2011 they soldiered on, winning where it mattered the most, at home. Reading the autobiography of Richie McCaw and his views of the various World Cups that he went to and hiding the extent of his injury from management/squad and his refusal to have x-rays taken until after the World Cup, shows the mark of a world class captain. His influence in the All Black squad is nothing sort of legendary, he reminds me of your player of jester year when guts and glory in the amateur area was all that counted. The Reason: Being a Cheetahs supporter has never been an easy thing. But in the era of Rassie Erasmus and the colourful cards from rooftops, the men from the Free State had started playing some expansive rugby and impressing on the way to the final in 2004. I headed to that final to witness my Cheetahs get a hammering from the Bulls and continuing our Currie Cup heartache from 1976. 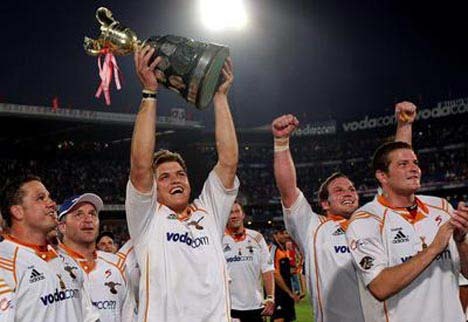 So onto 2005 and another showdown with the Bulls at Fortress Loftus. I headed to watch the game live and also watch the Bulls lead 25-12 with 10 minutes to play. The Cheetahs never give up though and a late converted try by Bevan Fortuin along with a penalty from Willem de Waal gave the Cheetahs a chance. 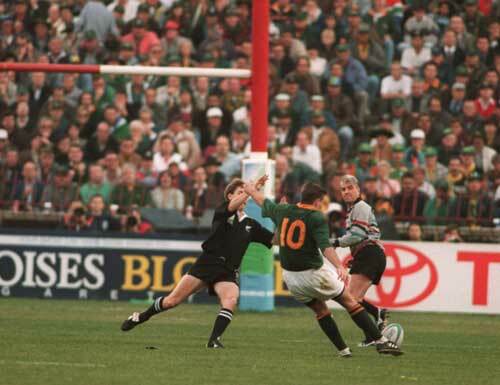 What happened next was a moment of absolute beauty as two Bulls players (I think one was Fourie du Preez) left the ball for each other, it bounced and Meyer Bosman took the bounce and scored a try under the posts. It was that very moment that ended 29 years of pain and caused hugs with anyone willing. The Blue Bulls supporter I embraced didn’t enjoy it that much, but hey that’s the bounce of the ball. EASY! 2007 Rugby World Cup final whistle. 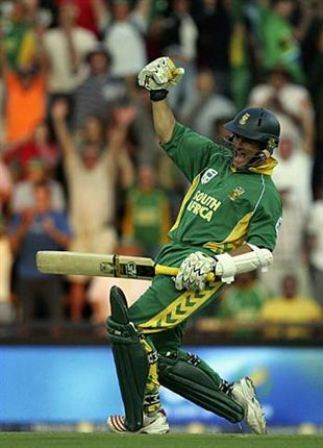 And the 438 game, that moment when Makhaya Ntini hit that all, but crucial single…I knew there and then that Bouch would kill it! I hugged a stranger on both times. Clearly no liverpool fans here, 4 moments Alonso making it 3-3 in Istanbul, Dudek pulling a Grobelaar and using the spaghetti legs to win the game! earlier that Season Gerrard’s pile driver against Olympiakos to put us into the knock out phase! FA cup final against West Ham, Gerrard once again producing a pile driver in Stoppage time to take us into extra time! Another one for me was when Scarra Ngobese scored the winner against Supersport to give Amakhosi the title in 2005. We filled the square in newtown for the announcement of who will host the FIFA 2010 world cup. Although excited and expectant, the disappointment of many years ago still hang over us. Will Morocco pip us? Will Tunisia steal it? Either way we stood, Vuvuzelas in hand, draped in flags, eye fixed on the massive screen. As Blatter began his speech, in French, I thought we had lost it. Morocco speaks French and Arabic I told mt friend. We definitely lost this again! When he asked for the envelope, I closed my eyes, and prayed. I didn’nt hear or see him show our name. I just heard the blast of a million vuvuzelas. 52 Million people screaming at the same time. People leapt into each others arms, We danced and shouted. We could not contain ourselves. I hugged a car guard next to me and 100’s joined into to a massive group hug in the square!